Linné on line – What is mass? Linné on line Physics and the Cosmos Physics and the Cosmos Quarks and leptons What is mass? Almost all particles have mass, but still we are not certain about the origin of mass. There is one plausible explanation, called the Higgs mechanism. According to this the particles get mass by interacting with a source-field (the Higgs-field) which exists everywhere in the Universe. Heavy particles interact more with the field than light particles (the coupling is proportional to the mass). One problem with the Higgs mechanism is that it predicts the existence of a particle, called the Higgs boson, which so far has not been observed. At CERN one plans a big new experiment to look for the Higgs boson. The so called LHC accelerator (Large Hadron Collider) will collide protons with an energy of 7 TeV, which means that they travel at about 99.999999 % of the speed of light. Picture of the LEP tunnel which in the future will be used for LHC. Layout of the ATLAS detector. One will use the same tunnel as was used for LEP also for the new accelerator since this gives both economical advantages and the possibility to reuse already existing infrastructure. 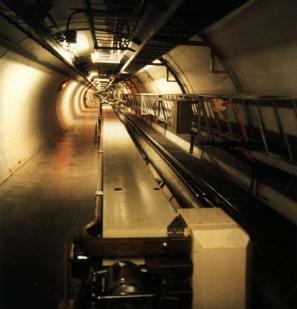 At one point one contemplated to keep the LEP accelerator in the tunnel in order to be able also to collide electrons and protons and study other interesting physics processes. But for reasons of economy and space one has decided to dismantle the LEP accelerator. Presently two experiments are being planned to study the proton collisions. In the one called ATLAS a group from Uppsala takes part actively. Their work is mainly concentrated on the construction of the vertex detector. With the help of this detector one can measure secondary decay vertices and thereby identify particles containing b quarks with high accuracy. The group has developed a radiation hard detector, both concerning the readout electronics as well as the semi-conductors used in the detector itself. See also the public page of the Atlas experiment at CERN.